Introducing all new NAVER Contacts app! * Search contacts of nearby places. * Easier and more convenient back-up. * Fresh and simple design. 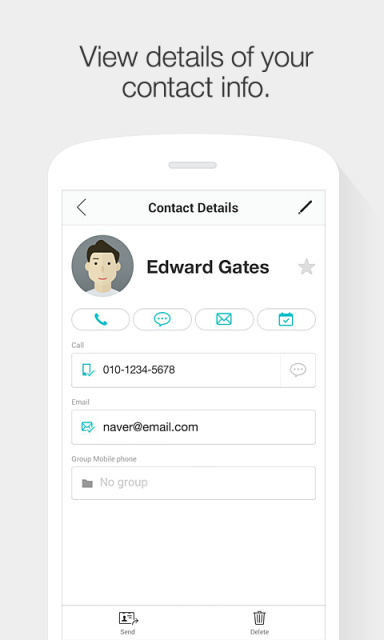 ※ New NAVER Contacts app (v.3.0) is available on Android OS 4.0 and after. 1. 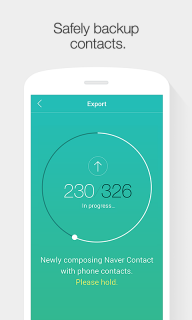 Search for digits that are not only in your contacts but also of the nearby places. You can easily find out answers to these questions that are not in your contacts along with your contact list. ※ ‘Nearby search’ is only supported in Korea. 2. 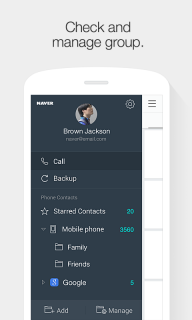 Back up your contacts more easily and safely. Was the restored contact after backing up your data different from what it originally was? 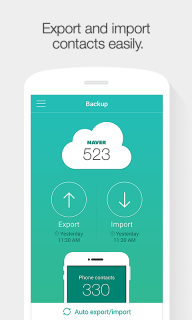 Are you confused between backup mode and sync mode? 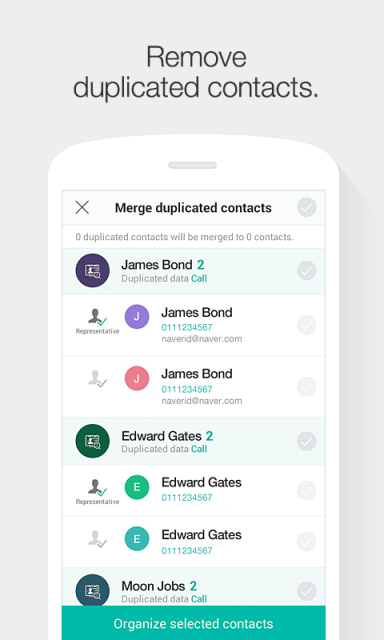 Now, you will no longer be confused in the new Contacts app. Anyone can back up and restore the data easily. No more stressful situation where the old contacts that you had backed up years ago being mixed up with your phone contacts. Without having to select the mode, simply backup and import the contacts whenever you need and you can also set to automatically export the contacts and import whenever you want! 3. 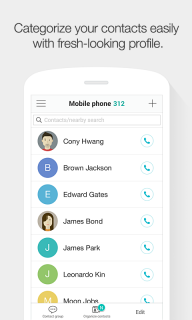 Neatly organize your contacts. 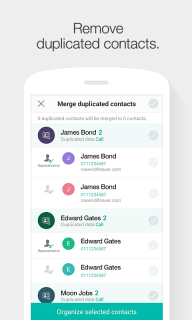 You can organize redundant and duplicate phone number and email addresses and delete contacts without names or phone number. 4. 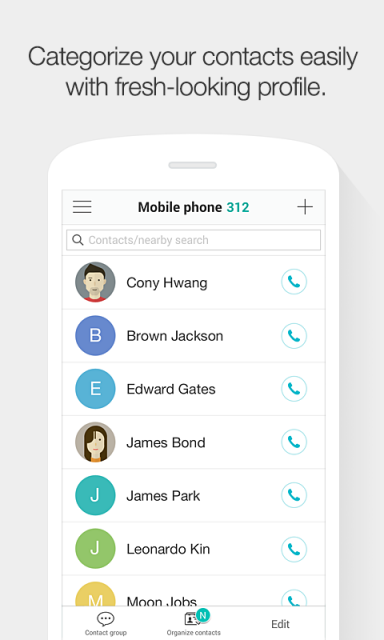 Manage your contacts in groups and contact your friends in group basis. 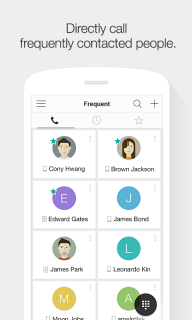 Collect all your contacts and organize into groups. With a single touch, you will be able to send group mail and texts. 5. Bring out NAVER Contact as Widget to wallpaper and contact your friends more conveniently. 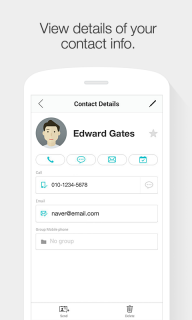 Create Contacts Widget to make call, send text and email all at once. 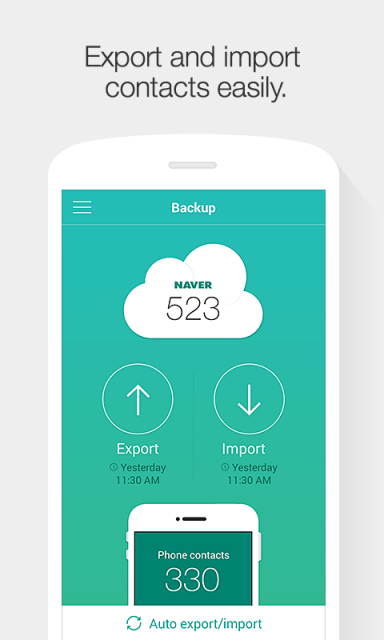 If you had lost your smartphone, NAVER Contacts support deletion and restoration of your contacts. If you had erased contacts on Contacts app by mistake, you can restore them in Trash.